You won’t need any charts to find Venus this month (or in January and February). Just go out after sunset and look to the southwest. Venus will be the brightest object in the sky — second only to the Moon. The “Evening Star” (as it’s sometimes called) is shining at magnitude -4.0 tonite, but will reach a dazzling -4.8 at its brightest. Venus will set 2-3 hours after sunset, but while it’s up you can’t miss it. Bright Venus has triggered more false UFO reports than any other celestial body. There’s two main reasons why Venus is so bright. First, it’s totally covered by bright clouds that reflect about 75% of the incoming sunlight. That’s the highest albedo of any planet. Second, it’s the closest planet to Earth for much of its orbit. The distance can range from 258,000,000 km (160,000,000 miles) at its farthest to 41,000,000 km (25,000,000 miles) at closest approach. But there’s a third factor that comes into play, and that’s what’s shown in the graphic above. 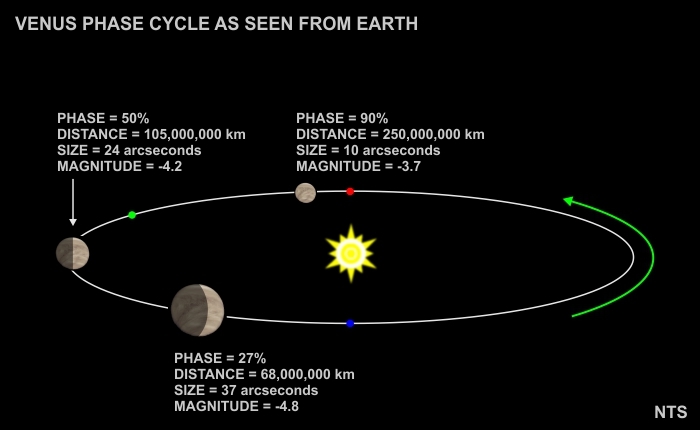 Because Earth is located outside the orbit of Venus we see it go through a series of phases, much like the Moon. This was first observed by Galileo in 1610. He reasoned geometrically that to observe this phase cycle, the Sun had to be at the center of the Solar System with Venus and Earth orbiting concentrically around it. The heliocentric theory was still being debated at that time, and this was one of the first actual observations to support it. As you can see, when Venus is at “full” phase (red dot) it is also farthest from Earth. That reduces its brightness. The graphic shows Venus slightly past that point, since at the exact time of 100% phase it’s located behind the Sun (as seen from Earth). By the time we can see it, it’s phase is reduced to maybe 90%. But it still looks “full” in a telescope. When Venus is closest to Earth (blue dot) its phase is “new” (the illuminated side is facing away from Earth) so we can’t see it. Somewhere between “full” and “new” we get the right combination of fullness and closeness that results in the greatest brightness. That happens when the phase reaches 27%. At the start of December Venus is located at the green dot. Its distance from Earth is 185,000,000 km (115,000,000 miles), its phase is roughly 60%, and it’s shining at about magnitude -4.1. It will continue to brighten over the next 80 days, reaching greatest eastern elongation (greatest apparent distance from the Sun) on January 12, 2017, and greatest brightness on February 18, 2017. After that, Venus will continue to fade in brightness as it approaches its “new” phase at the point closest to Earth. That’s where it makes the transition from “Evening Star” to “Morning Star.” More about that here.